Tall Timber. Van Wagner's Timber Heritage Program. 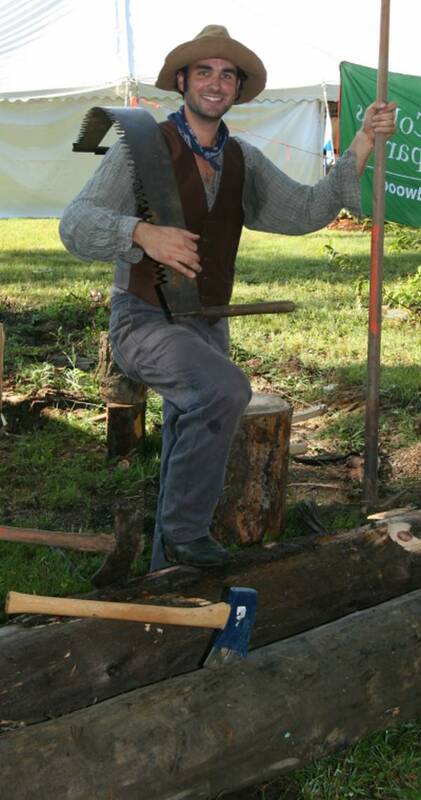 Van Wagner, songwriter, historian and Pennsylvania logger has developed a program celebrating the past and present of the Pennsylvania timber industry. Wagner is a native of the Danville. 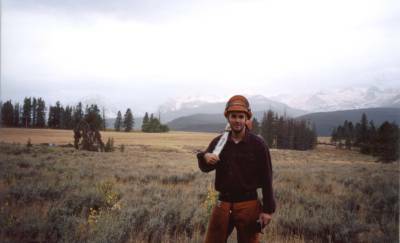 He worked for Daniel Logging in Idaho as well as on many independent logging projects in Pennsylvania. His songs have been performed all over the world and have been featured in several film productions. Enjoy this unique program as Wagner takes you on a journey through Pennsylvania's timber heritage. 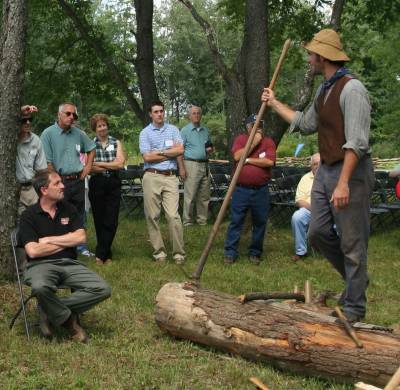 This program reviews the past, present and future of Pennsylvania's Timber heritage. This program covers how timber was harvested over the past several centuries and most importantly WHO harvested it. 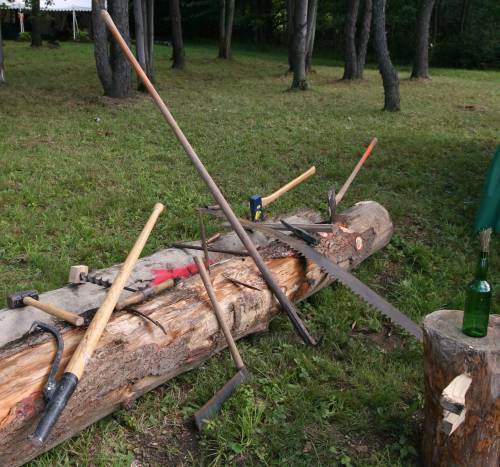 Wagner demonstrates dozens of tools spanning 200 years of logging history. 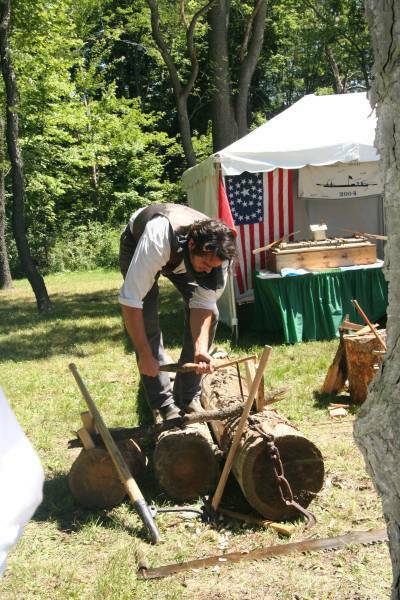 The program also focuses on the rafting days when millions of board feet of Pennsylvania Timber were assembled into various styles of rafts and piloted down our streams and rivers. Wagner was part of a group who built and piloted a 105 foot timber raft down a section of the North Branch of the Susquehanna River. It was the first time a raft traveled that portion of water in a century. 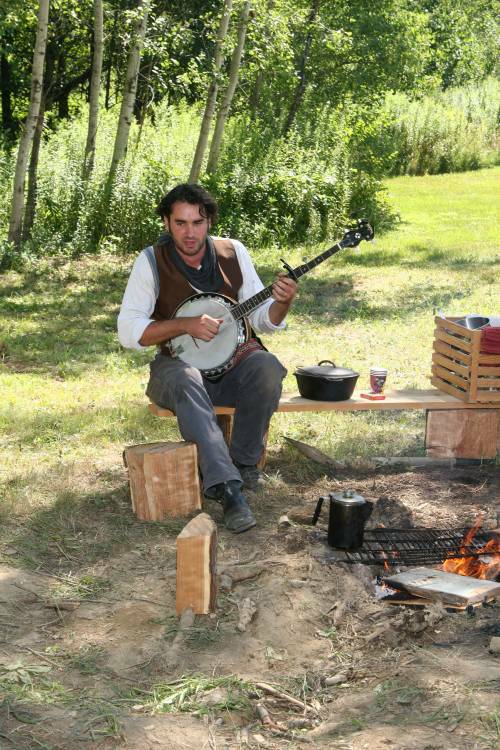 A little bit of music, a little bit of laughter, and lot of culture make this unique educational program a reminder of why we should be proud to be from the Timber Country of Pennsylvania. Although the logging industry of Pennsylvania was centered around Williamsport and the West Branch of the Susquehanna River, the North Branch also contributed a great deal to the story of Pennsylvania timber. The virgin forests of Penn’s Woods held some of the finest White Pine ever seen. This species of tree was invaluable to American settlers. The grain of this tree is straight and true, and it will resist rot and will not warp. Although very light in weight, it is remarkably strong. Not only was this resource valued by the naval vessels for masts and spars on ships, but the farmers Pennsylvania’s southern tier had an insatiable thirst for wood to construct homes and barns. White Pine floats very well and was also used to transport goods from the frontier to the markets downstream, sometimes as far as Baltimore. Later, loggers headed into the headwaters of the Susquehanna for the Eastern Hemlock tree.The bark was used to make tannic acid for Pennsylvania’s thriving tanneries, and the lumber was found to be a very suitable lumber. A voyage across theAtlantic does not involve so much danger to life and property, as the navigation on the river.This was reaffirmed in March 1938.A group of former lumbermen built a commemorative raft with the intent to navigate it from the small West Branch town of Burnside to Harrisburg.They named the endeavor the “Last Raft.”On the morning of March 20, the raft tied loose from its overnight stay in Williamsport.Later in the day, tragedy struck.The raft, with 48 people aboard, slammed into two bridges between Muncy and Montgomery.Seven people were drowned as the raft tilted and dumped many of the passengers. The raft did continue towards its destination and was eventually tied off about 8 miles above Harrisburg and the timber sold to a lumber buyer. Other attempts to construct and float a log raft have occurred since the "Last Raft," although none on the North Branch.These other rafts include one built by Lycoming College students in 1964, a raft on the West Branch in 1976, and another raft on the West Branch in March-April of 2004 to commemorate the bicentennial of Clearfield County. 2003 - Sometime during 2003, Van Wagner and Karl Shellenberger came up with the idea of building a log raft similar to those that were used to transport timber to downstream markets in the 1700s and 1800s. early 2004 - Van and Karl began researching the history and construction techniques of log rafts. This included a trip to the Lycoming County Historical Society Museum, where we obtained excellent information on the construction of the Last Raft of 1937. July 15, 2004 - Raft is tied loose from the shore at the Shultz Farm and floated to just past the Danville River Bridge so that people could see the raft during the Iron Heritage Festival. July 18, 2004 - Raft is once again tied loose and floated a few more miles downstream to a location in Point Township, Northumberland County. July 22, 2004 - Raft is tied loose again and floated downstream to near the border of Upper Augusta Township and Rush Township, Northumberland County. July 28, 2004 - Raft gets hit by a log during a period of high water and takes off downstream. A group of firefighters and Ken Kremser were able to rescue the raft. Without that, it may have hit the fabridam in Sunbury. Dams were not a hazard that the oarsmen had to deal with back in the 1800s. The raft ended its journey at Packers Island in Sunbury. August 8, 2004 - The raft is deconstructed and the logs will become lumber. S. Stranahan.“Susquehanna: River of Dreams”John Hopkins University Press, 1993. Myers, Richmond E “The Long Crooked River”. (The Susquehanna) Boston,(1949) The Christopher Publishing House. 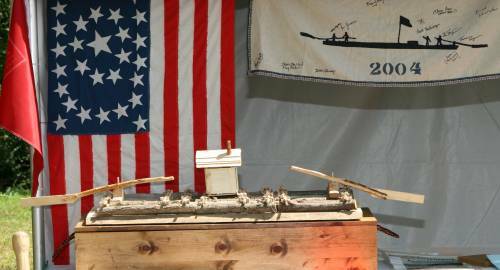 Clearfield County Bicentennial Log Raft. An old Boy Scout guide to canoeing on the West Branch from Clearfield to North Bend can be found here. It may take a while to load, but it is very interesting reading and has some great information about the history of the river.